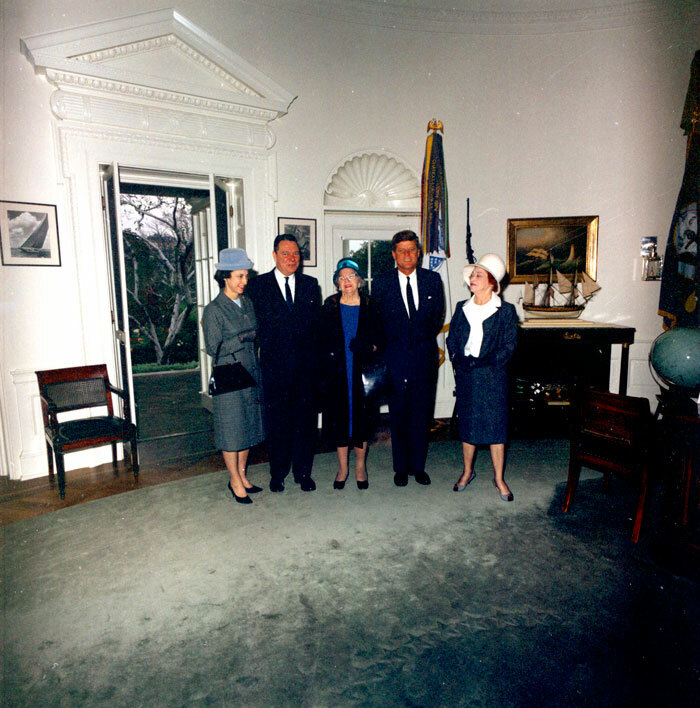 The Oral History Collection at the John F. Kennedy Presidential Library includes an interview with Corinne “Lindy” Boggs, a notable member of the House of Representatives from Louisiana and a longtime friend of the Kennedy family. Sadly, Boggs passed away at her home in Maryland on Saturday, July 30th at the age of 97, leaving behind a prodigious legacy in politics that spanned several decades. Prior to her own political career on Capitol Hill, Lindy Boggs supported her husband, Thomas Hale Boggs, who served as a congressional representative from Louisiana from 1941 until 1943. Hale Boggs served again in 1947, eventually becoming House Majority Leader until his death in 1972, when a plane in which he was traveling disappeared over Alaska. Following this tragic incident, Lindy Boggs was chosen by special election to fill her husband’s vacant spot, becoming the first woman from the state of Louisiana to be elected to Congress, a position she held for nine consecutive terms. In 1976, she was also the first woman to preside over the Democratic National Convention. Boggs’s career included the championing of many progressive programs and legislation—perhaps most notably those related to women’s equality and civil rights. She fought for women’s access to equal pay and financial security throughout the course of her congressional career and strongly supported civil rights legislation, despite the risk of incurring criticism from her Southern constituency. 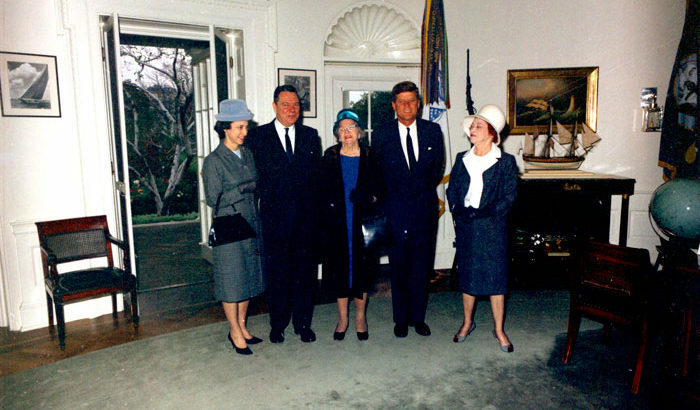 Within her oral history interview, Lindy Boggs speaks at length about her and her husband’s friendship with the Kennedys, as well as her behind-the-scenes work as a political wife for the Democratic Party at that time. She gives voice to the experiences of other political wives and women in Washington, calling them “a remarkable lot” for the work they accomplished, diving head first into projects for fundraising and philanthropy, political campaign support, as well as other civic engagement efforts in the arts and entertainment. Perhaps not surprisingly, Boggs acknowledged that her work as a political wife prior to her husband’s death prepared her for her own time in Congress. The relationships and friendships she made while following his career became vital to her successful transition into politics, and she acknowledged feeling “privileged” to have supporters all around her. One of Boggs’s major contributions during the Kennedy years was her role as co-chair of the inaugural ball planning committee. The committee was tasked with overseeing not only the celebratory pageantry of the gala, but also its business side as a major fundraising event in Washington. In her oral history interview, Boggs tells the story of how she, ironically, missed the inauguration of President Kennedy because of last-minute logistical problems caused by a massive snowstorm in Washington the night before, threatening to interfere with ticket distribution for the inaugural ball. Lindy Boggs remained a representative in Congress until 1991. In 1997, President Clinton elected her as the United States Ambassador to the Holy See, a position she held for six years. Her death represents the passing of an era, and we are honored to hold a piece of her important legacy in the Archives of the Kennedy Library. Lindy Boggs’s oral history interview can be found here. Her daughter is the noted journalist, author, and NPR senior analyst, Cokie Roberts.